We travelled by train till Chakki Bank railway station. It is on the Delhi-Jammu line, near Pathankhot. From there, we hired a taxi. 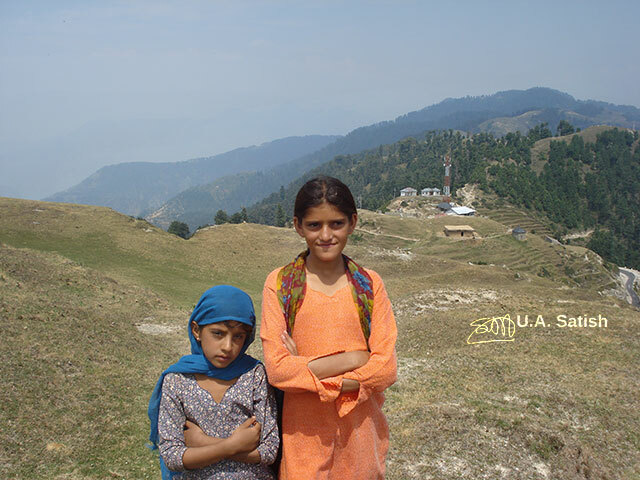 The air became cooler as we climbed up the hilly route to Dalhousie. The journey took about 2 hours 30 minutes (85km). 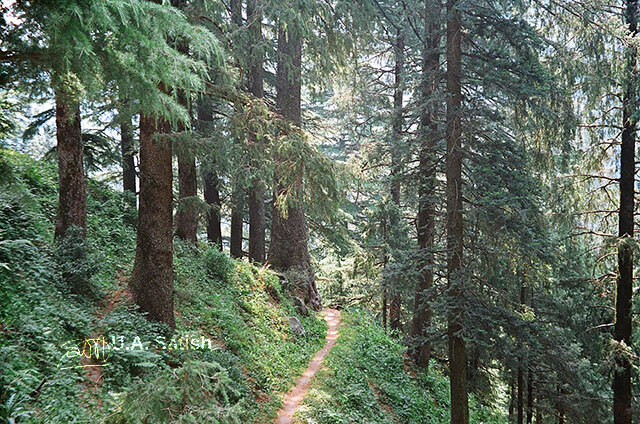 Dalhousie is like most hill stations in India. There is a cluster of buildings and shops at the centre of the hill town. Houses are built on the slopes with a structure of long stilts (mostly of concrete). In winter time, the number of visitors come down and many of the migrant workers move out to the plains. 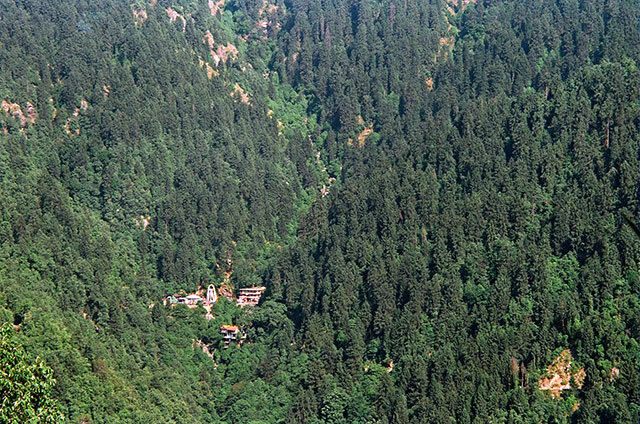 We could see a small temple down below, among the trees. We decided to walk down to it. It was comfortable going down. But the climb up to our hotel was a bit tough. 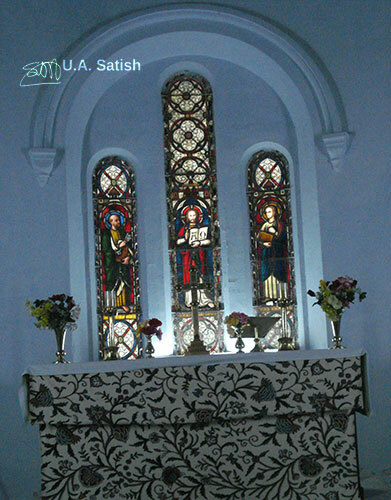 St. John’s Church was built by the British. It has been maintained in good condition. Regular services are being conducted. The priest allowed us to go inside and see the interior of the church. It is a neat little church with rows of benches for the faithful. 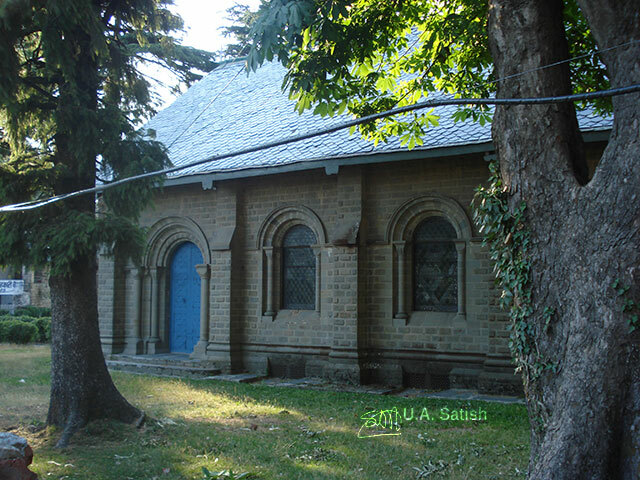 Built in 1863, it is located in the crowded Gandhi Chowk area. There are stained glass glass windows which are beautiful. They are likely to be from British times. 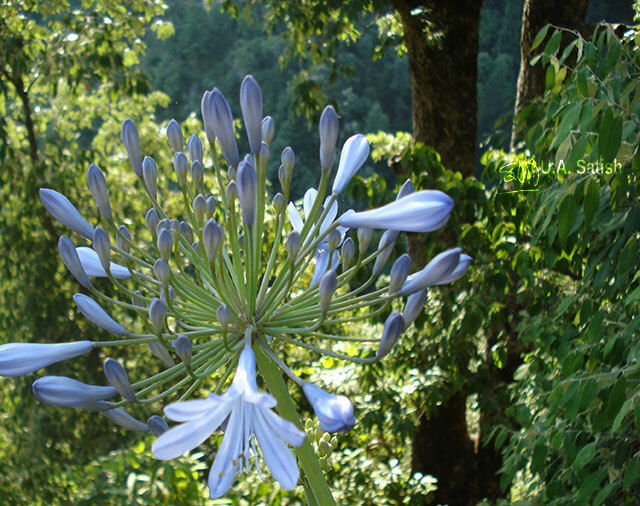 I found a blue Agapanthus flower (African lily) by the roadside in Dalhousie. It is a lovely flower with strong stems and large heads. I had not seen it before. May be it grows only in cool climates. 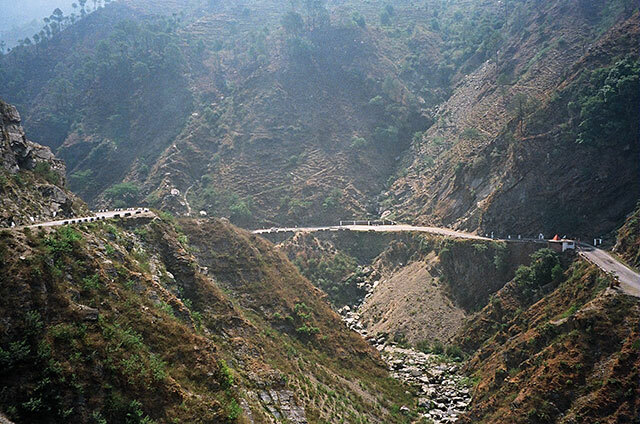 The roads in Himachal Pradesh are good. 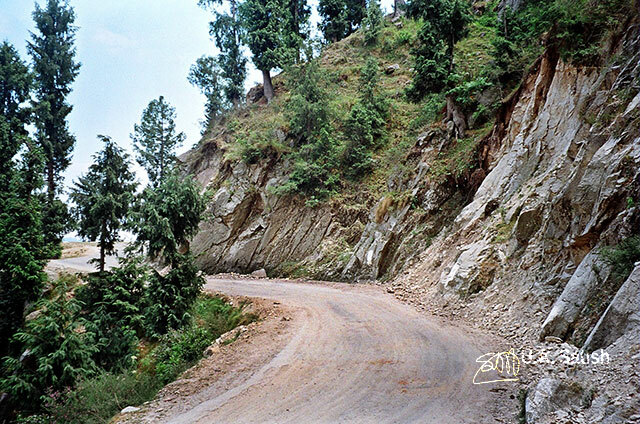 Border Roads Organisation maintains many of them. Traffic was not heavy. I noticed a number of army vehicles on the road. 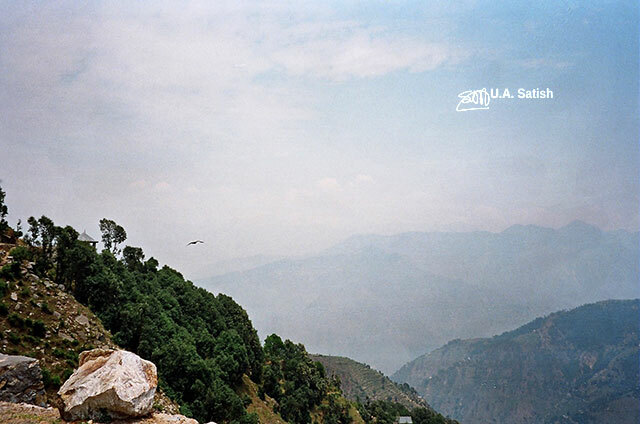 Dalhousie is not far from the international border. 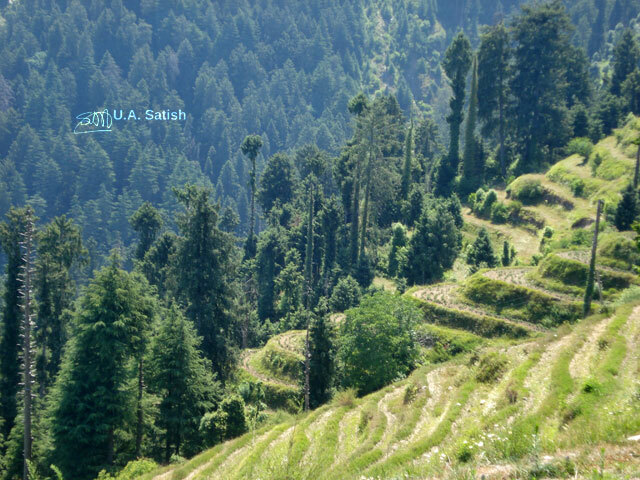 The terrain in Dalhousie is hilly. Terraced cultivation has to be used on the slopes. Apples are grown widely. 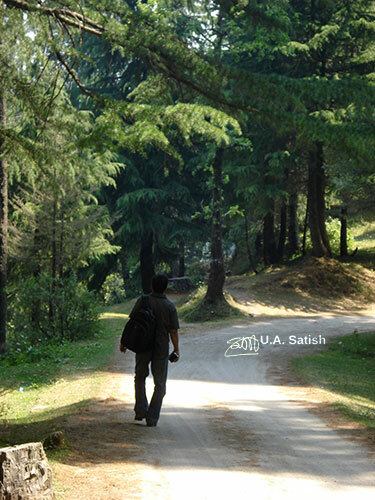 Himachal Pradesh has earned fame as the Apple State. Other fruits produced in Himachal Pradesh include plum, peach, apricot, strawberry, litchi, guava and orange. Driving on these roads is a highly skilled job. The roads are cut on the mountain slopes. There is often a sheer drop on the other side. Passing another car on the narrow and winding roads is not without risks. The road shown above is at a height of 10,000 feet. 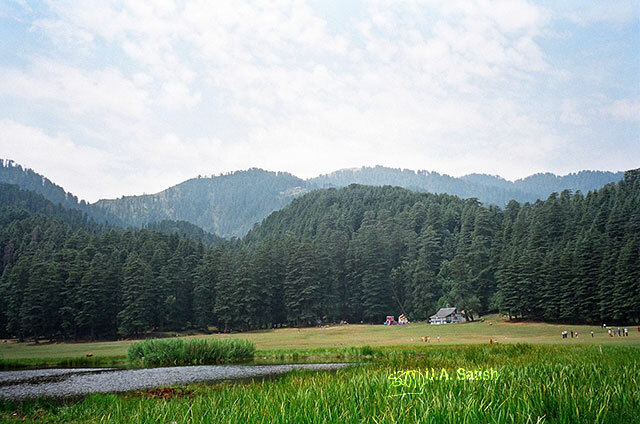 Khajjiar is a scenic area near Dalhousie. 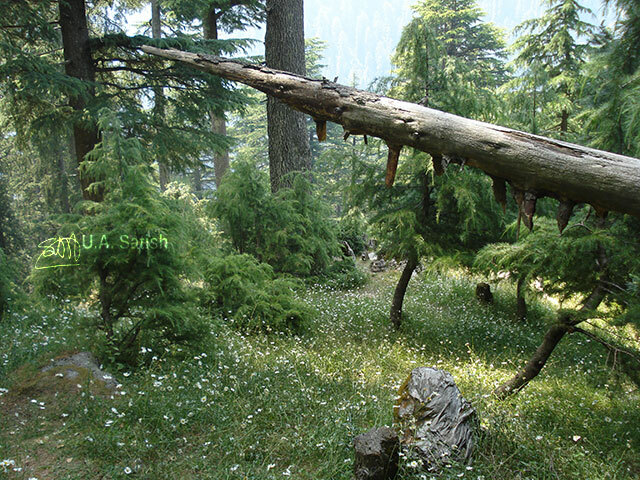 There is a beautiful glade with tall Himalayan cedars along the periphery. It has a circumference of five kilometres. A lake can be seen in the middle which is fed by brooks running through the glade. Horse riding is a favourite activity of visitors to Khajjiar. 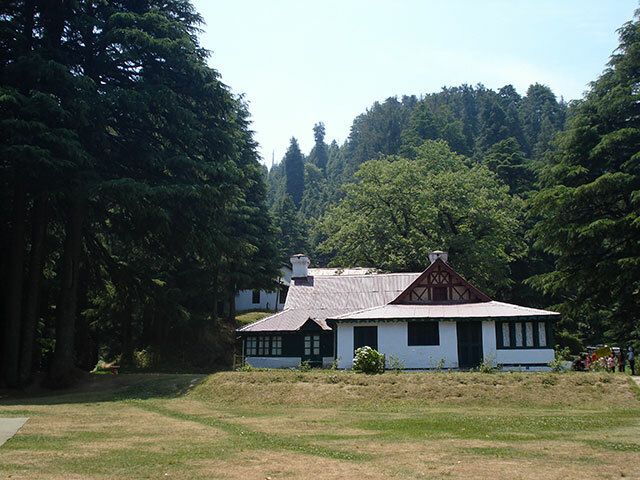 Kalatope is an animal sanctuary, 6 km from Dalhousie. 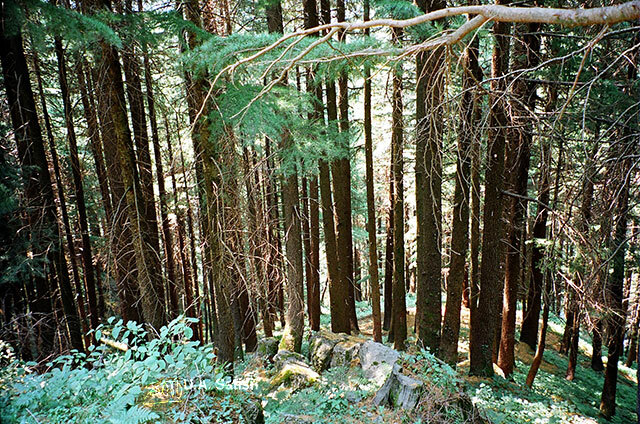 There are dense forests of cedars and pine. An entry fee has to be paid. The area is clean and pollution free. Inside there is a 3km stretch which leads to the jungle rest house. We covered part of the route on foot. Although it is an animal sanctuary, we did not come across any animal. The place is free of noise pollution. It was refreshing to walk by the forests of pine, oak and cedar trees. There is a rest house inside the forest. It is a quaint cottage set in a picturesque location. There are big trees around it with a lawn in front. Thee are well laid out trekking paths in Kalatope. The sanctuary is supposed to have wild animals including bears, jackals and leopards. But their population may be small. Jot Pass is at a height of 8,600 feet. It is 70 km from Pathankhot. In summer months, families move from the plains to Jot Pass. They come in search of pastures for their cows. Himachal Pradesh means Land of Snowy Mountains. The state is in Outer Himalayas. Snow covered Himalayan peaks can be seen in the distance. On a clear day you can see Lahore across the border.